Offered in this lot are five game used bats. 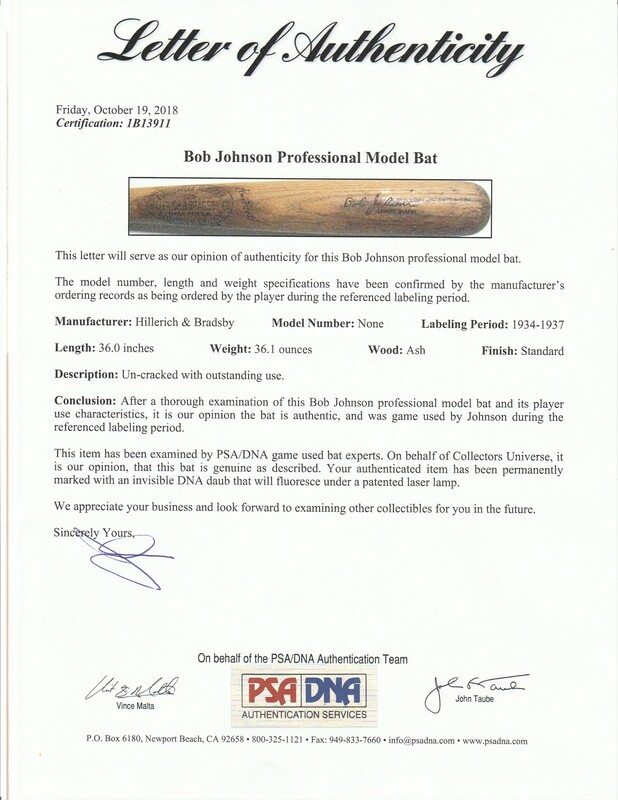 The first bat was used by Bob Johnson during the 1934-37 seasons. This bat displays outstanding use and is un-cracked. There are ball marks cleat imprints on the barrel. This bat comes with a LOA from PSA/DNA (1B13911). 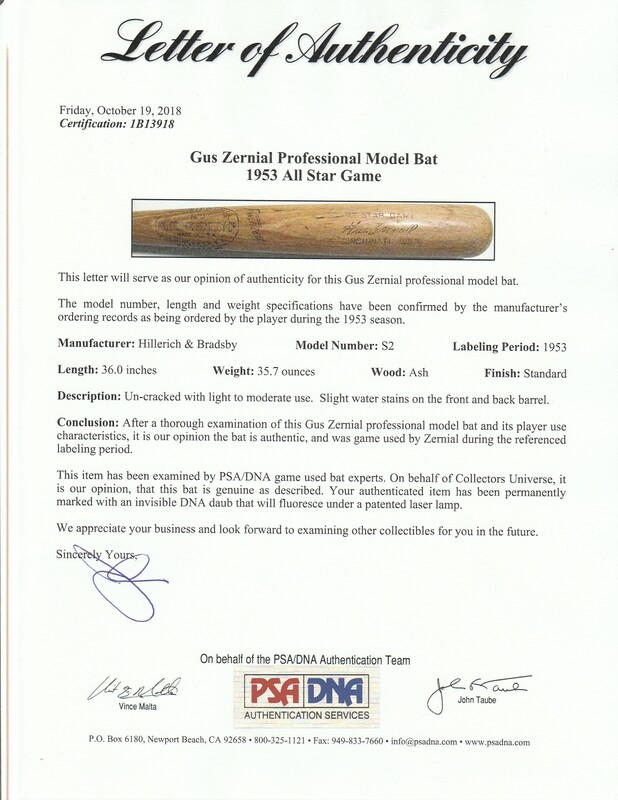 The second bat in this lot was used by Gus Zernial during the 1953 All-Star Game. This Hillerich & Bradsby S2 model bat displays moderate use and is un-cracked. “ALL STAR GAME CINCINNATI 1953” is stamped on the barrel. There are slight water stains on the front and back barrel. This bat comes with a LOA from PSA/DNA (1B13918). The next bat in this lot was used by Dave Stapleton during the 1973-75 seasons. This Hillerich & Bradsby S2 model bat displays outstanding game use and has a crack on the handle. Stapleton’s number “16” is hand written in black marker on the knob and top barrel. This bat comes with a LOA from PSA/DNA (1B13913). 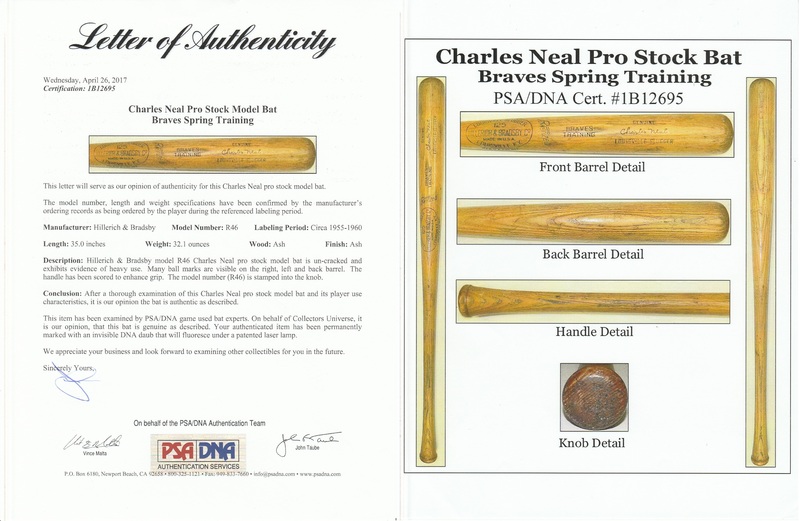 The fourth bat in this lot was used by Charlie Neal for spring training and has a labeling period between 1955-1960. This Hillerich & Bradsby R46 pro stock model bat displays heavy game use and is un-cracked. There are ball marks on the barrel and the handle has been scored to enhance the grip. The model number “R46” is stamped on the knob. 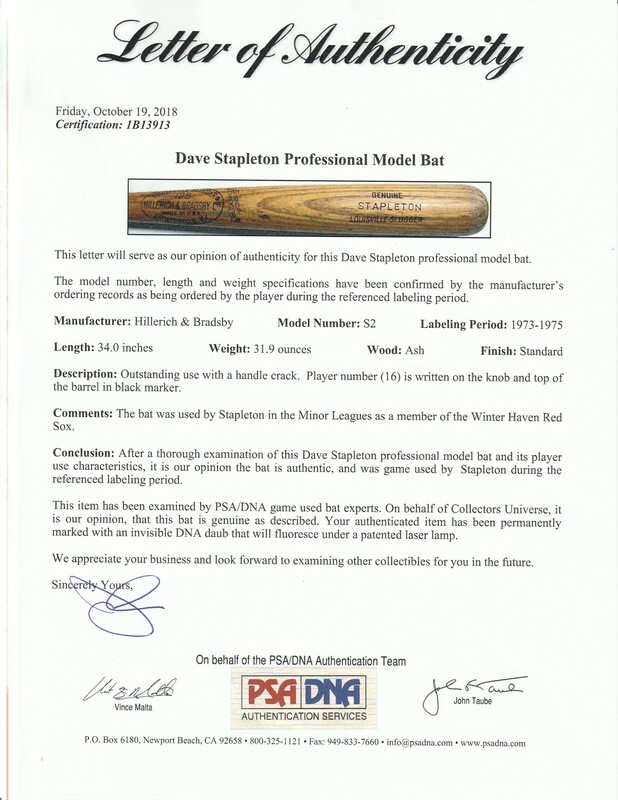 This bat comes with a LOA from PSA/DNA (1B12695). The final bat in this lot has been attributed to be used by Louis Lembke during the 1923-25 seasons. This pre-model Hillerich & Bradsby bat displays heavy use and has a crack on the handle up and into the barrel. There is a chip on the knob and there are ball marks and cleat imprints on the barrel. The right barrel has been planed to receive factory side writing which reads “Geo. Tally 7-22-26”. This bat comes with a LOA from PSA/DNA (1B15349).